Quad biking in Addo: Looking to experience a different side to the Greater Addo area? Get off the beaten track and experience true adventure with Crisscross Adventures. Crisscross Adventures, located 11 km from the Addo Park Main Camp Gate, have been the Addo tour, Safari and Adventure specialists since 2004. Their mission is to encourage clients to enjoy and experience their range of different activities which showcase and promote the diversity of the area. Being a company built on passion with their impeccable safety record, Crisscross Adventures offer quality, safe and affordable adventure tours of the Greater Addo area. Their local Addo Tours feature Addo Elephant National Park game drives (full day and half day options), as well as a variety of other Addo Activities such as: Quad biking, Addo River safari’s on the Sundays River, hiking the Zuurberg mountains, Sand boarding & Ferry Cruise, Beach and Mountain Safaris. Crisscross Adventures Headquarters is situated in Addo Village area, adjacent to the magnificently pristine Sundays River. The valley bushveld thicket, breathtaking views, fragrant citrus orchards, and thriving birdlife make their Quad biking tours one of the must do activities in the area. Their quad tracks are unique and hand cut to perfection. On arrival their qualified & experienced guides will brief you on how to operate the controls of their new Yamaha Grizzly’s (ATV’s) as well as kit you out with helmets, goggles and safety gear. They also provide 2 piece suites for those needing them in the more muddy/wet weather, making this an all-weather activity. In order to get the best out of your adventure, and to assess your experience level, they guides start with a few practice laps in the near vicinity. The tracks range from scenic routes for the beginners on open roads and through citrus orchards, to technical routes which have clever twists, turns and inclines next to the Sundays River through riverine thicket. 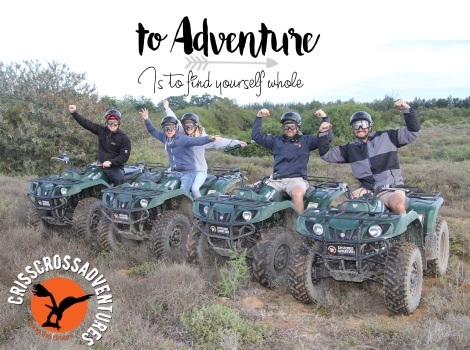 Crisscross Adventures offers you 1 ½ hour, 3 hour, and full day Quad biking experiences showcasing the diversity of the Addo area. Due to the real risk of accidents and Crisscross Adventures taking Safety very importantly, children under 16 years old are not permitted to drive the ATV’s alone, but can ride tandem with a parent or guide. If you are looking to experience a different side to Addo, get off the beaten track and go experience true adventure with Crisscross Adventures.